Can You Lose Weight With Cayenne Pepper Pills? It sure would be nice to be able to simply pop a pill and lose weight. While there is some evidence that cayenne pepper may increase your metabolism, you may be better off losing the pounds the old-fashioned way -- through diet and exercise. Consult your doctor before adding any dietary supplements to your regimen, including cayenne pepper pills, which can have adverse effects for many people. Cayenne pepper is a spice used in a variety of cuisines, including Creole, Asian and Mexican. The component that gives these foods their spicy kick -- capsaicin -- also happens to be the one thought to aid in weight loss. In addition to possibly helping you lose some of those unwanted pounds, capsaicin also has pain-relieving properties. You can find capsaicin in the fresh peppers and dried spice as well as cayenne pepper pills. Cayenne pepper, used as either a food or a supplement, may help you lose weight by increasing your metabolism, helping your body burn fat and decreasing your appetite. In fact, a 2012 review study published in Appetite reports that capsaicin may help you burn an extra 50 calories a day and may produce a significant weight loss over a one- to two-year period. Results of cayenne pepper's calorie-burning capabilities have been inconsistent, however, according to a 2012 review study published in Chemical Senses. Cayenne pepper may not be as effective at upping the metabolism in overweight and obese people, says the study. It's also noted that the effects decrease over time, which might mean your body develops a tolerance. And if that's the case and you're already a regular consumer of spicy food, cayenne pepper pills may not be beneficial at all. As with any herbal supplement, there are always potential side effects and health concerns when taking something like cayenne pepper pills. The University of Maryland Medical Center notes that while it's safe for nursing women to eat cayenne pepper in food, taking it in supplement form is not recommended because it passes into the breast milk. Additionally, if you have an ulcer or experience heartburn when eating spicy foods, you may also have ill effects when taking cayenne pepper pills. Also, if you take too much, you may experience stomach pain. People who are allergic to latex, kiwi, bananas, avocados or chestnuts may be allergic to cayenne as well. Cayenne pepper pills also potentially interact with a number of medications -- both prescription and over-the-counter -- including high blood pressure drugs, stomach acid reducers, blood thinners, diabetes medications and the asthma drug theophylline. In addition, there's concern for interactions with blood-thinning herbal supplements, such as ginkgo, ginger, ginseng and garlic, so avoid cayenne pepper pills if you're taking any of them. Instead of popping a pill to help you lose weight, use cayenne pepper in its natural form, fresh or dried, and add it to your food. With only 6 calories per teaspoon, the spice adds a lot of flavor with very few calories, making it a good choice for any weight-loss plan. Sprinkle some of the dried powder on your hard-boiled eggs at breakfast for a little heat, or mix it in your bean soup at lunch. Chop the fresh pepper and saute it with your stir-fry or stir it in with your brown rice. 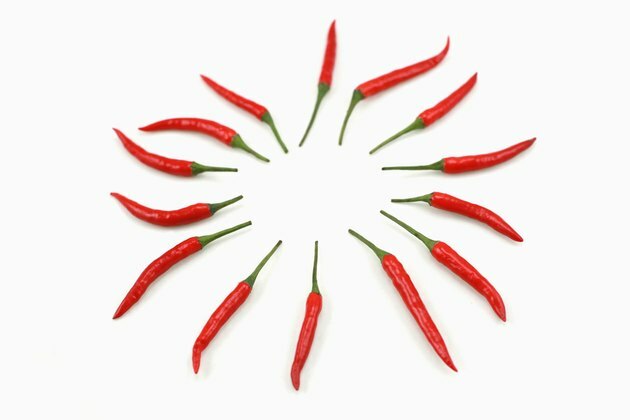 Cayenne pepper also adds spicy heat to chili, stews, meats and vegetable dishes.